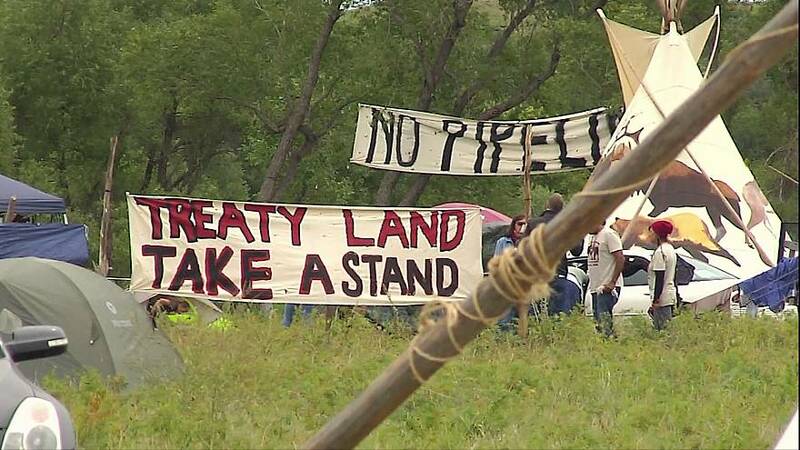 Police in the US state of North Dakota have begun clearing a group of Native American and environmental protesters from an encampment near an oil pipeline construction site. There are concerns it could escalate tensions in a standoff that has lasted several months. There are reports at least 141 people have been arrested. Officers began clearing the encampment after protesters allegedly set fire to barricades around a construction site near the community of Cannon Ball. The 3.8 billion dollar project is being built by a group of companies led by Energy Transfer Partners to take shale oil from North Dakota to oil refineries on the US Gulf Coast. Supporters say it would be safer and more cost-effective than transporting the oil by road or rail. However, the Standing Rock Sioux Tribe, backed by environmental activists, say it threatens the water supply and sacred tribal sites. They have been protesting for several months. Dozens have been arrested. Members of the Standing Rock Sioux Tribe have asked Democratic presidential nominee Hillary Clinton to oppose the pipeline. Clinton has so far not taken a public position on the issue. On Monday, Native American protesters occupied privately-owned land in the path of the proposed pipeline. They say they are the rightful owners of the land under the terms of an 1851 treaty with the US government. Police moved in on Tuesday, after saying protesters had set some blockades on fire. Media footage seems to show police rounding up and handcuffing protesters.